Another strength is its ability to be weapon mounted behind most collimated daylight aimers and Reflex sights such as the Trijicon and Aimpoint systems. This allows the user the ability to use their PVS-14 both as a night vision monocular for increased mobility and tactical awareness and as a short range weaponsight. All NVD PVS-14s are built with Exelis GEN III Pinnacle Auto Gated image intensifier tubes, and are available with Commercial, MIL GRADE or MIL SPEC tubes. All units are built to order and include NVD's 10 year warranty - The best in the market. 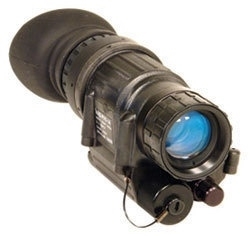 Warning: All Night Vision Devices and Accessories are subject to ITAR restrictions. This equipment cannot be exported from the US without US State Department authorization. Other restrictions apply.